This is the sequel Halloween fans have been awaiting for four decades. With John Carpenter whispering in his ear (the original director returned in an "advisory" capacity and as co-composer), David Gordon Green has taken the series back to its roots. Terror and horror have replaced bloodlust. Although some elements of the slasher genre are present (for example, the body count is approximately four times as high as it was in the 1978 film), Green was committed to making this movie more about gore and viscera. 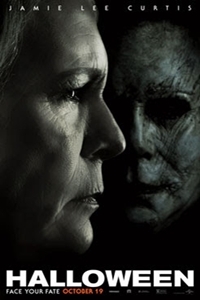 Michael Meyers has once again become "The Shape," with his half-assed backstory jettisoned as neatly as nine of the ten previous features to bear the Halloween moniker. Although the film skews toward veteran Halloween lovers, it's by no means unfriendly to neophytes. The newbie's point-of-entry is provided via a pair of podcasters (played by Rhian Rees and Jefferson Hall) who sketch out Michael's past - the 1963 murder of his sister, Judith (this is presented using flashbacks from the original Halloween), his condemnation as "pure evil" by his psychiatrist (audio recordings of either Donald Pleasence or a sound-alike), and his 1978 Halloween night rampage through Haddonfield, Illinois. Those familiar with Carpenter's movie will note that Green has liberally seeded the 2018 edition with homages. Some are fairly obvious (a girl gazing out her classroom window, a vanishing body, a ghostly apparition, a hovering face, and closets with slatted doors) while others are more subtle. While the movie embraces the malignancy of Michael, it introduces a new dynamic for his surviving 1978 victim. In 1998's H20, we saw one vision of the PTSD-suffering Laurie. Here, we get a slightly different interpretation. This Laurie (again played by Jamie Lee Curtis) is a cold, brutal avenging angel. She's the spiritual successor of Dr. Loomis, believing that the only solution for Michael is to obliterate him. As a result, Halloween introduces something rarely explored in slasher movies: victim empowerment. Laurie doesn't fear Michael any more than she fears death. She was the hunted in 1978; forty years later, she's the hunter. And, unlike the masked killer, she isn't content with a knife. She has an arsenal of firearms and intends to use them. Laurie's daughter, Karen (Judy Greer), thinks her mom - who drinks too much and lives in an isolated, fortified house - is nuts. Removed from Laurie by social services at the age of 12, Karen has sought to live a "normal" life with her husband, Ray (Toby Huss), and daughter, Allyson (Andi Matichak). But when Michael escapes while being transferred from Smith's Grove to another asylum, three generations of Strode women have to confront the living nightmare in different ways. To play Laurie Mark 3, Curtis draws a little on the version of the character that tangled with Michael in H20 but with more venom. It's a remarkably committed interpretation of a woman whose life has been destroyed by unprocessed trauma. This is Laurie's catharsis and Curtis plays it to the hilt. She's not merely on hand for the paycheck. Although Judy Greer at first seems to be underused, she's given an opportunity to shine in the last act. Newcomer Andi Matichak takes on the role of the "young innocent," a modern-day equivalent of Laurie circa 1978. Aside from Michael, the movie lacks a strong male presence, although Will Patton plays an often-bewildered police officer and Haluk Bilginer is Loomis disciple Dr. Sartain, Michael's unbalanced psychiatrist. As for The Shape, he is mostly portrayed by James Jude Courtney, although the actor who filled those shoes in 1978, Nick Castle (who's now 71), dons the mask in scenes where not a lot of physical activity is required. This represents the first opportunity for mega-producer Jon Blum (of Blumhouse) to work with a horror icon and he was content to sit back and allow the creative team to re-invigorate Michael. Malek Akkad has returned as a producer - a role he has filled since 1995, when he joined his father Moustapha (who died in 2005; this movie is dedicated to him) as one of the series' guardian angels. An Akkad has been involved in every Halloween movie from the beginning. The Blum-Akkad fusion is an effective metaphor for Halloween 2018, where old meets new and the slow-burn terrors of 1978 reach out across the years to shock and frighten a new generation.